Hello everyone, I hope you've been well. I knew I was way overdue for a "recent delights" post when some of the delights aren't that recent anymore. So here we go! Another edition of various odds and ends I've encountered lately. My capoeira instructor came back from a trip to Brazil earlier this year, and he brought back these Brazilian banana confections with him. It's apparently pure banana. That's right, banana is the only ingredient in this sweet, chewy candy called "bananinha". I have no idea how it's made, but I imagine the bananas are cooked down until they're all thick and caramelised, then poured into a tray to set, before being cut up into pieces. How's that for a guess? I've also received a very similar banana candy from a Thai colleague, though I think that one had additional ingredients, and as a result, a slightly more complex flavour profile. Either way, these are pretty nice snacks. Maybe I should try making my own one day. 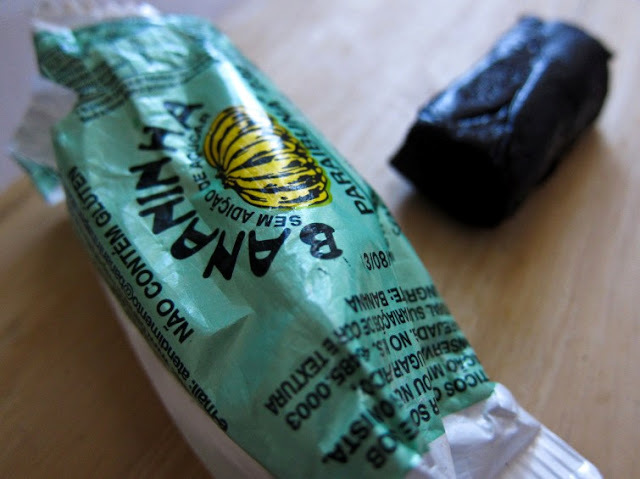 Bananinha, a Brazilian sweet... basically, banana candy. The carbonated citrus drink, Orangina, is quite common back home in Malaysia but I rarely see it here in Melbourne, or anywhere in Australia, really. However, one of my local spots, Le Petit Français Crêperie & Café in South Yarra, serves it. Intrigued, I hopped online to find out more about Orangina's story. Two things: 1) I find out that it's actually Algerian in origin, 2) I'd always assumed that it was just a fizzy orange drink, but I now know that it also contains lemon, mandarin, and grapefruit juices. I'm a bit of a citrus fiend so I guess this explains why I find this beverage so attractive. That plus the nostalgia factor, no doubt. Orangina, a sparkling citrus beverage. Simon's housemates went to Daylesford a while ago, and they brought back some lovely fruit preserves. 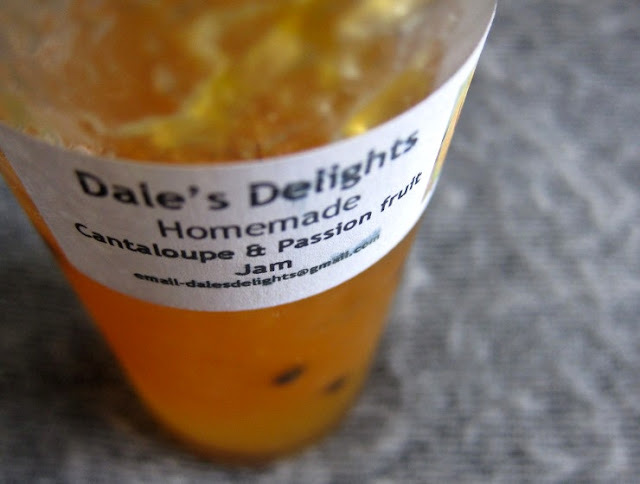 Our favourite one was the homemade cantaloupe and passion fruit jam by Dale's Delights. I don't know if I've ever had a melon-based jam before this, but I'm a total convert - it was fresh, dewy, charming, playful. This is the kind of jam that makes people happy. Cantaloupe jam. So fragrantly delicious. I've also recently fallen in love with Havarti cheese. It's mellow and creamy and nutty and almost mushroomy. I can be a bit of a wimp when it comes to cheese, but Havarti strikes a pleasing balance for me with sweet, rounded flavours that don't get too strong and crazy. It's popular as a dessert cheese, with fruit and wine, and I can certainly see why. Obviously I had to pair it up with that exquisite cantaloupe jam, on top of some garlic and herb water crackers. It was a beautiful match all around. 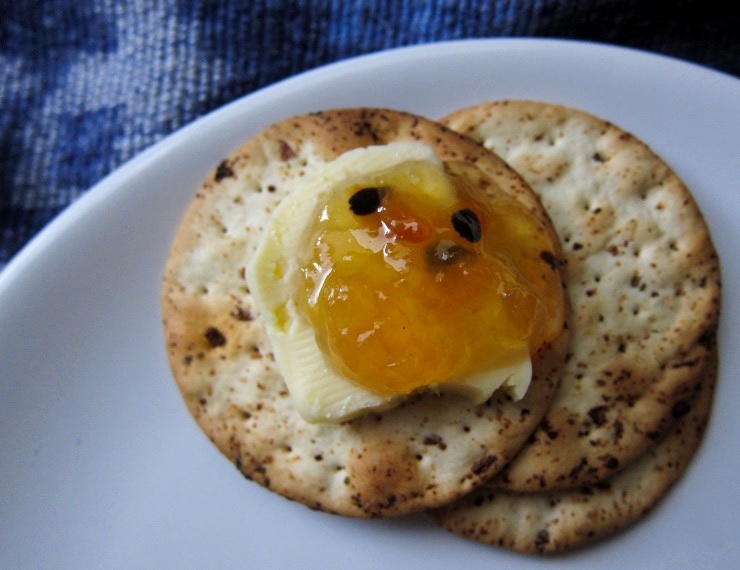 Garlic and herb crackers, Havarti cheese, cantaloupe and passionfruit jam. What are some of your recent delights? Interesting to read about how bananas were processed for the candy. Oh yes, orangina is commonly here but I seldom have this drink. That's quite a pairing, the jam with crackers and certainly its attracting my attention. My dad was a big one for dried bananas when I was growing up (not the dried out banana chips but whole dried bananas) and they are quite sweet ... not surprised that those sweets are good. I've never had whole dried bananas, sounds interesting! Ack, just saw this message got stuck in spam! Yes, I should try to make the bananinha! I love those dried bananas, so I can imagine how good the sweets are! 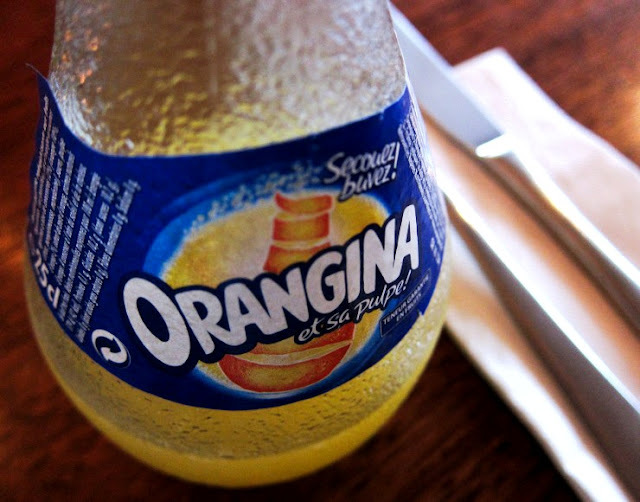 Orangina! That stuff is awesome. I've never heard of bananinha, but it sounds really good. Thanks for sharing this post, it's always nice to discover new foods from around the world! Glad you agree about Orangina - it's such a delightful soft drink! The bananinha was pretty nice, not too sweet, and enjoyable to chew on. I only wish I had more! Love the sound of the canteloupe and passionfruit jam. I make one with peaches and passionfruit... exquisite! It's such a delicious jam. Yours with peach and passionfruit sounds wonderful, too! cantaloupe and passion fruit jam sounds like the perfect alternative to marmalade on those warm summer days. Bring back summer!!! It's pretty darn awesome. Actually they got grapefruit marmalade too, but the cantaloupe jam was the one that won our hearts. Interesting sounding banana snack.. Mmm yum? Cantaloupe jam...interesting! I could totally see that spread on bread with arugula and some kind of cheese. Love this little selection of delights. I am fascinated by the banana candy. It is quite intriguing, isn't it? I'm definitely keen on experimenting on making my own. Yeah I wish we can get Orangina more easily in Australia! Where else do you get it in Melbourne? BANANA CANDY! omg I need some of that in my life! SOunds so interesting and the packaigng too is gorgeous!